The Bank of Canada today issued the new vertical $10 bank note featuring the portrait of social justice icon Viola Desmond, during a ceremony at the Canadian Museum for Human Rights (CMHR) in Winnipeg. Canadians will start to see this new note over the coming weeks and months as it gradually enters into circulation alongside existing $10 notes. Bank of Canada Governor Stephen S. Poloz and Wanda Robson, Viola Desmond's sister, spoke about Desmond's legacy and the ongoing pursuit of human rights and social justice in Canada. They spent the first new bank notes at the CMHR, which itself is featured on the back of the new note. Desmond, a successful Nova Scotia businesswoman, defiantly refused to leave a whites-only area of a movie theatre in 1946. Her court case was an inspiration for the pursuit of racial equality across Canada. A map of the historic North End of Halifax, where she lived and worked, is also shown on the note. The back of the note carries Desmond’s legacy into the present with several images and symbols. These include the CMHR, the first museum in the world dedicated solely to the evolution, celebration and future of human rights. Its criss-crossing ramps symbolize the history of human rights in Canada and the world—a history of setbacks and contradictions, but built on strength and hope. The back also features an eagle feather, representing the ongoing journey toward recognizing rights and freedoms for Indigenous peoples in Canada; an excerpt from the Canadian Charter of Rights and Freedoms; and a pattern of laurel leaves, an ancient symbol of justice, which is found in the grand entrance hall of the Supreme Court of Canada. The new $10 bank note will be rolled out in Canadian financial institutions starting today. It will gradually replace other $10 bank notes in circulation, including the Canada 150 commemorative note and the Frontiers series $10 note, as they wear out. With the issuance of this new $10 note, the Bank of Canada’s approach to issuing bank notes is changing. Rather than issuing all five denominations within a short time frame, a new note will be issued every few years. This will allow the Bank to integrate the latest security features each time a new bank note is issued. In due course, the Bank will consult Canadians on the design of the next $5 bank note. 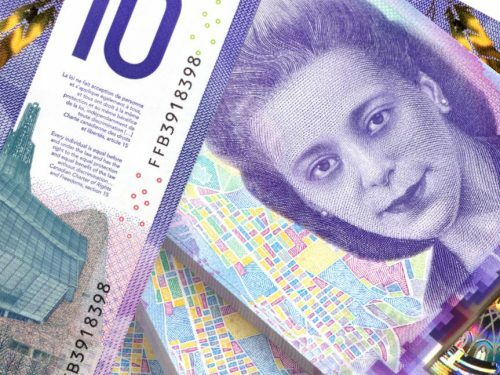 The new vertical $10 note featuring Viola Desmond is the same size and has the same functionality and the same distinct purple colour as the previous $10 polymer note. It has a suite of accessibility features for Canadians who are blind or partially sighted, including its distinct purple colour, tactile features and high-contrast numerals. Videos (including b-roll) are available for download upon request. Find images and videos of the new note on Flickr and YouTube. Starting on November 30, the Bank of Canada Museum in Ottawa will feature a special exhibition entitled A Noteworthy Woman that explores the story of Viola Desmond and the new $10 bank note. Read about our principles for bank note design. Visit our bank notes page for information and resources on past and current Canadian bank notes. Learn more about the Bank of Canada Museum and the CMHR. At the request of the family, media wishing to speak with Viola Desmond’s relatives are kindly asked to contact the Bank of Canada .